Yahoo France head of studios Michèle Benzeno (left), and Coca-Cola NW Europe and Nordics strategic digital marketing manager Julien Guiraud presented a solid example of branded content: what the pair did together for women, fashion, the Coke Light brand, with the illustrious Karl Lagerfeld of Chanel. 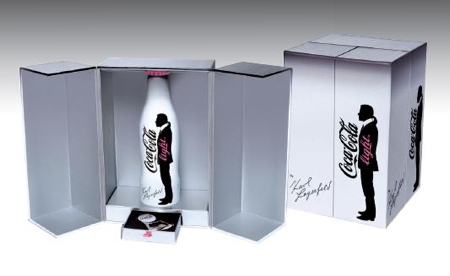 With that, 2010 saw the launch of the Karl Lagerfeld signature line of Coke bottles and cans, featuring a starkly simple aesthetic and Lagerfeld’s instantly recognisable silhouette. Lagerfeld agreed to the collabo if he could also design the ad campaign, which made Coke nervous, but which they ultimately agreed to. Yahoo operated on the (surprising?) premise that 84% of users “want to learn something” from branded entertainment – that they expect the same quality of content production and integrity from brands that they do from journalists and experts. Its strategy was to use a dedicated fashion channel on Yahoo.com to interpret “fashion” online, and give women a single new fashion inspiration daily. Thus was born The Daily Woman, a fashion site with a soft feminine aesthetic, its content then flanked by ambient Coca Light skins in the minimalist Karl Lagerfeld style. The big takeaway here is the one that you’ll recognise, in some form or another, at the heart of every branded content manifesto: be relevant to your context. Commit to making content of quality. Please and nourish your users. Familiar lines, but always worth repeating!